See also antiviral agents , immunomodulators and adaptogens . , 571 р. Average online price * , 571 r.
"Lavomax" refers to immunomodulators and antiviral agents that activate the synthesis of interferon in the body. Because of this, it is effective in combating a number of infectious diseases caused by pathogenic microorganisms. in the complex treatment of patients with the following diagnoses: cytomegalavirus, viral and infectious-allergic encephalomyelitis, non-gonococcal urethritis, respiratory and urogenital chlamydial infections, pulmonary tuberculosis. “Lavomax” is taken after meals with water. Dosage and duration of treatment depends on the disease, and is selected individually. Influenza and SARS: In the first 2 days, adult patients are prescribed 125 mg of the drug once a day, then they take 125 mg every 48 hours. The total course of treatment is 750 mg (6 tablets). As a prevention during seasonal epidemics, 125 mg is taken weekly for at least 6 weeks. Viral hepatitis A: On the first day of treatment, 125 mg should be taken twice a day, starting from the second, 125 mg every 48 hours, and during the general course of treatment the patient should take 1.25 g of the drug (10 tablets). For prophylactic purposes, patients are prescribed 125 mg weekly, the duration of the course is six weeks. Viral hepatitis B: In the first two days of Lavomax therapy, patients take 125 mg once a day, and then 125 mg every 48 hours, the general course is 2 g (16 tablets), but with a complicated course of the disease, the amount of the drug can be increased to 2 , 5 g (20 tablets). Viral hepatitis C: The drug is taken as follows: 250 mg for the first two days, followed by 125 mg every 48 hours. In general, the patient is recommended to take 2.5 g (20 tablets), then proceed to maintenance treatment - 125 mg once a week. Citalomegavirus and herpes infection: 125 mg for the first two days, then 125 mg with a frequency of 48 hours. General course - 2.5 g (20 tablets). Chlamydial infection: The regimen is similar to the previous one, but the total course dose is 1.25 g (10 tablets). individual sensitivity to individual components of the drug. 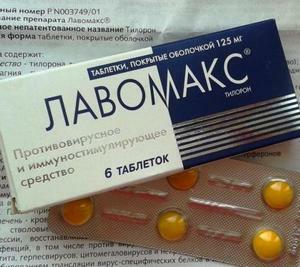 To date, information about the overdose "Lavomaxom" does not exist. In most cases, the drug is well tolerated by patients, but in some cases there may be side effects in the form of allergic reactions, short-term chills and gastrointestinal disorders. 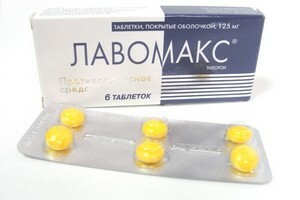 "Lavamax" is available in the form of tablets in a shell of 10 or 6 tablets in a blister. The main active ingredient is tilorone (125 mg per tablet). Auxiliary components: sodium hydroxycarbonate hydrate, povidone, silicon dioxide, calcium stearate, sucrose, natural wax, liquid paraffin, talc, titanium dioscid, high molecular weight polyethylene glycol. After taking the drug, its active substance tilorone is very quickly absorbed in the gastrointestinal tract, and bioavailability is 60%. Tiloron does not have the ability to accumulate in the body, does not undergo biological transformation and is excreted in feces and urine in practically unchanged form. Lavomax can be combined with antibiotics and drugs that are commonly used to treat viral infections. “Lavomax” is available in pharmacies without a prescription. It is recommended to store the drug in inaccessible places for children at a temperature of 15-25 ° C for no more than two years.